Sleep is an essential part of life. At one point or another, we have all had issues getting enough sleep. When you don’t sleep well you start a cycle of being overly tired. Your work, your relationships, and finally your entire life begins to suffer. As a sufferer of chronic back pain, I am no stranger to sleepless nights. On my journey to finding a more peaceful, restful sleep I have slept on (or tried to sleep on) many different kinds of beds and mattresses. Once I discovered the S-Cape Adjustable Bed System I was finally able to relieve my back pain and get the sleep I desperately needed. In recent years, adjustable beds have grown in popularity and are now more affordable than ever before. There are a wide variety of manufacturers and designs to choose from. Typically, an adjustable bed allows the user to move both the head and foot of the bed to different levels depending on what is most comfortable for them. An adjustable bed system allows for a revolutionary way to customize your sleeping position so you can get the sleep you deserve. Adjustable beds have proven helpful for individuals with a variety of issues including insomnia, sleep apnea, back pain, leg pain, heart issues, circulatory system disease, and many others as well. Adjustable beds vary from the traditional bed system. With traditional beds, you would have a mattress, a box spring, and a frame of some sort. Adjustable beds are comprised of a mattress on to of a bed base that has the capability to lift and lower both the head and feet. You don’t need a box spring or a special frame. Some manufacturers sell both the bed base and the mattress while others only sell one part. Depending on what brand you like, you may need to purchase pieces separately. If you are planning on moving a few times in the near future, an adjustable bed could make things a bit difficult. The bed bases are heavy. Some weigh upwards of 700 pounds. I can tell you from personal experience that while it is tough to move them, it can be done. Some users new to adjustable beds are startled when they realize they make noise while moving into new positions. I learned this fact in the middle of the night. Luckily you do grow accustomed to it and many manufacturers use motors that are very quiet. The S-Cape Adjustable Bed System includes everything you need to start enjoying restful sleep again. The system includes a Legget & Platt adjustable split king bed base with two back-lit wireless stand-up remote controls. Each side of the bed base is able to move independently from the other and has its own remote, which is perfect for couples sharing a bed. 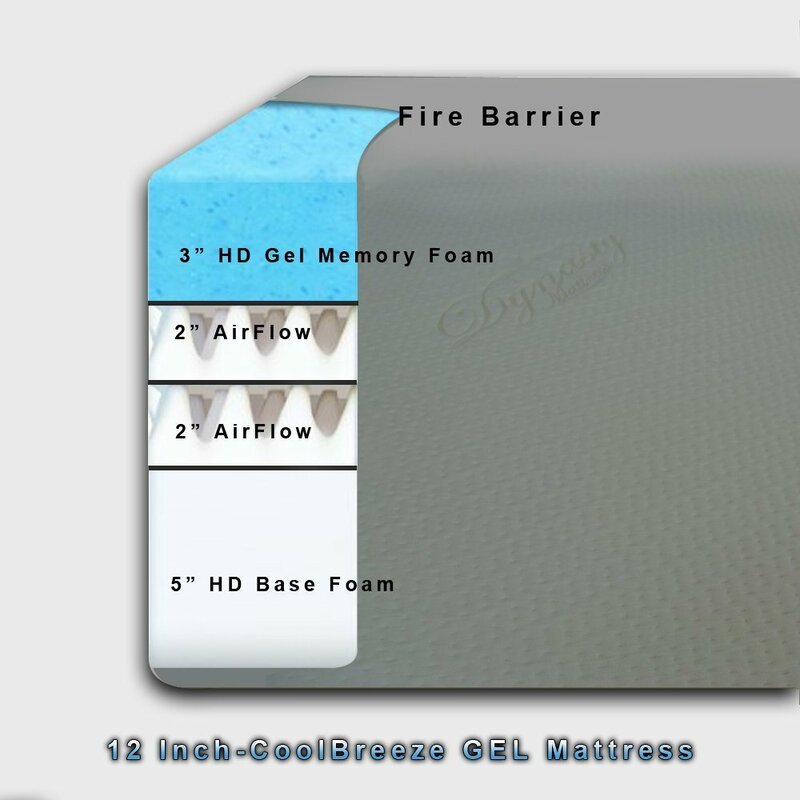 Also included are two 12-inch CoolBreeze Gel Mattresses by DynastyMattress. Each mattress is crafted from a 5-inch HD soft foam for a supportive base layer, 4 inches of state of the art Cool Airflow Foam, and topped with 3 inches of HD CoolBreeze Gel foam. This bed also features a soothing wave massage function, so that you can truly relax as you drift off to sleep. A great benefit of the S-Cape Adjustable Bed System is that it includes the bed base and mattresses. You don’t have to worry about whether your mattress will fit your bed base since they were created to complement one another perfectly. This option also includes free home delivery and set up which will save you time, stress, and possible arguments with whoever is helping you set up the bed base. The S-Cape Adjustable Bed System has a wonderful variety of features and benefits. It has some options that make it stand out from other options. We’ve studied the features and have provided you with a breakdown detailing what makes this option special. The S-Cape Adjustable Bed System includes a back-lit stand-up wireless remote. You can see it easier at night thanks to the backlighting in case you want to change positions. The wireless remote makes it easy to move the bed into hundreds of therapeutic positions and preset it your favorites so that you can sleep comfortably and improve your health. 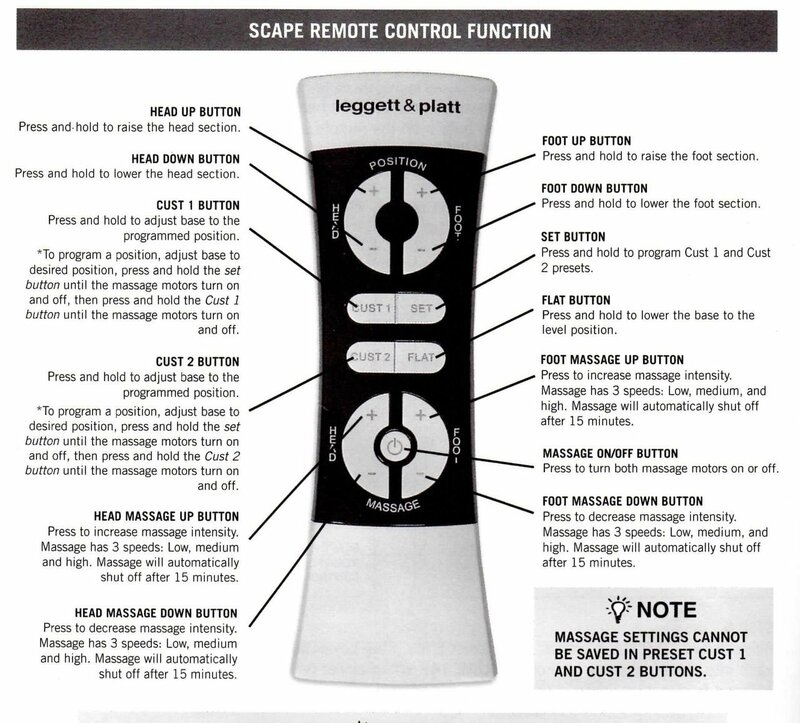 The remote also allows you to turn on the soothing wave massage so you can feel pampered and relaxed anytime. The CoolBreeze Gel Memory Foam ensures you won’t become overheated while sleeping. This mattress has a medium-firm consistency so it feels amazing for users with back and leg pain especially when the foot of the bed is elevated. Many other health issues can be helped with the S-Cape Adjustable Bed System as well. With the head of the bed elevated users can reduce esophageal acid exposure for those who have conditions such as Gastrointestinal Esophageal Reflux Disease (GERD), heartburn, or acid reflux. The S-Cape Adjustable Bed System features the patented Wallhugger design, which keeps you closer to your nightstand while ensuring your head, neck, and shoulders are well supported. The bed base also includes 4″ legs and casters. This option can easily support up to 700 pounds. The total height of the legs, bed base, and mattresses all together is 25 inches, allowing it to fit perfectly in any room in your home. The Reverie 8Q Adjustable Base System includes two 15.5 inch AtlantisBreeze Gel Mattresses. The head and foot of the bed can adjust to a wide variety of positions and features a split design to allow each side to be in different positions. This bed base allows the owner to control the bed thru a Bluetooth Smart Mobile Module which means you could use your tablet or phone to operate it. This model also includes the features of a massage function, wireless remote, and under bed lighting. This is a good option for those who want an adjustable bed with Bluetooth capabilities and do not mind the much higher price. The Quatro Sleep Adjustable Bed includes wireless remotes and is easy to assemble. It has an adjustable leg height option. This model is less expensive, but it does not include a mattress. You will need to purchase two twin size extra-long mattresses as it will not work with a king size mattress. This option is a good choice for anyone who wants a more basic adjustable bed base option and wants to pick their mattresses separately. The Legget & Platt Performance Adjustable Bed Base includes wireless remotes and a massage function. This moderately priced option does not come with mattresses, so they need to be purchased separately. This bed base utilizes a quiet motor and the patented Wallhugger design. This is a good option for those who want a good base and would like to pick out their own mattresses. Please take a few minutes to look at these alternative options and then be sure to let us know if you have tried any of them by leaving a comment below. In conclusion, the S-Cape Adjustable Bed System is a groundbreaking way to solve many of your sleep problems. It has a plethora of amazing features including wireless back-lit stand-up remotes, a relaxing massage option, Wallhugger design, free in-home delivery and set up, a 30-year warranty, and it includes two high comfort CoolBreeze Gel Mattresses. This sleep system allows you to choose between hundreds of positions to relieve insomnia, chronic pain, acid reflux issues, heart disease, and many other medical conditions. It can also give you the best night of sleep in your life every night. Click here to see the many features and benefits of the S-Cape Adjustable Bed System and don’t forget to tell us what you think of this sleep system in the comments. This entry was posted on June 11, 2017 by admin.